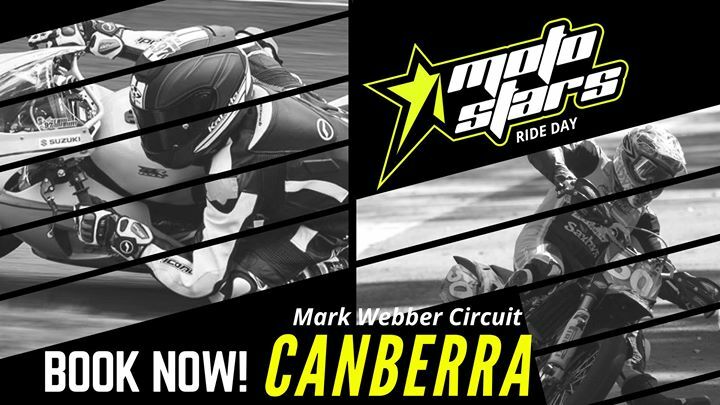 MotoStars will run a Ride and Coaching Day at Canberra’s Circuit Mark Webber on Easter Saturday 31st of March! Open to JUNIORS, MINIGP, GROM, Z125, R15, R3, 300 Ninja RIDERS, SUPERMOTO RIDERS, DIRT TRACKERS, RECREATIONAL RIDERS- almost anyone with a motorbike! Riding starts from 9am- runs till 5pm. NOISE LIMITS APPLY- Standard exhausts or muffler inserts recommended for Supermoto machines. 95db restricted. *Track Sliders- Front and Rear Axle Sliders, Footpeg Sliders, Handlebar Sliders. *Catch tanks- All overflow hoses must be guided into a catch tank bottle fastened to your bike. JUNIORS ARE MOST WELCOME, from 5-15years. ROAD BIKES are also welcome but limited to 500cc (some exceptions- check for details). They will be run in a separate session from Supermoto machines. Additional personal coaching available with former MotoGP racer, Damian Cudlin. Please pre-book to avoid disappointment. There is NO LICENCE REQUIRED. You can also choose from our range of hire bikes, Kayo 150’s, Honda CBR150’s and CBR125’s all available for $150 per day.